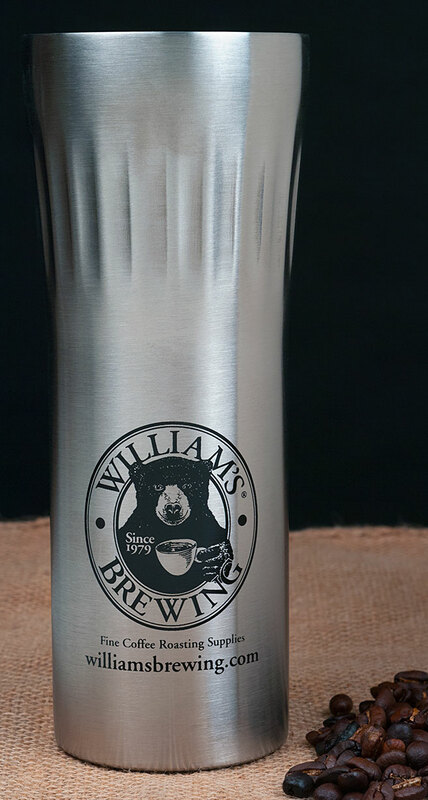 The William's Insulated Commuter Mug features double wall vacuum insulated 304 stainless construction, with copper in between the walls for even better insulation. 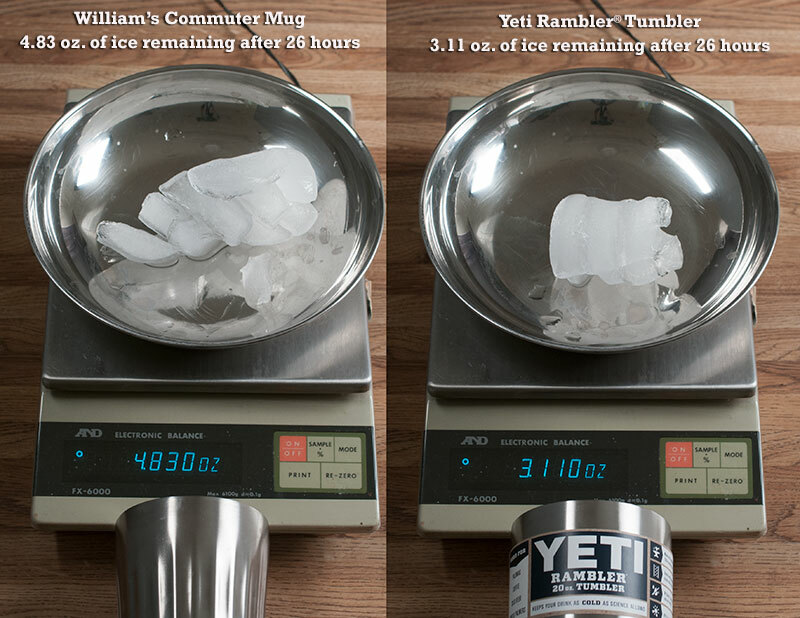 The result is a mug that preserves more ice over a 26 hour period than the YETI® Rambler Tumbler. This test was conducted by putting 13 ice cubes (6.6 oz of ice) in each mug and closing the lids and leaving the mugs at room temperature (approximately 68° F). After 26 hours, the water was drained off and the ice weighed. (click on the thumbnail above for the results of our test). In addition, it features a silicone sealed leakproof contained twist cap that keeps your lips away from plastic contact, resulting in a better drinking experience. 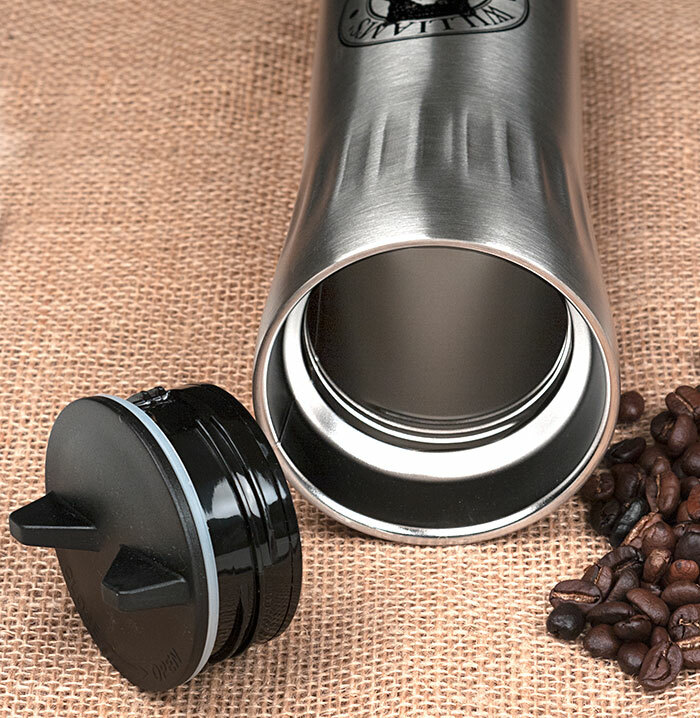 The 16 ounce Commuter Mug is perfect for your home roasted coffee, as well as ice cold beverages, and of course, beer. Make your commute a little better, and keep something cold a long time for the weekend as well. 8½" tall, 2¾" wide (fits in all car cup holders). While too tall to fit under my coffee maker, I am amazed how long it keeps my coffee hot without needing to be completely sealed while I am not actively drinking it. One issue I had on the first day I used it was when I rinsed the coffee out and filled it with ice water. I screwed the lid snug and it created a vacuum preventing me, or any of my coworkers, from being able to open it until it eventually warmed. I now am more careful how tightly I seal it with cold liquid inside. Has kept my coffee hot of rat least 6 hours. Has kept coffee warm for 24 hours. Lid does not leak. I can find absolutely no problems with this mug. "Made of double-wall stainless steel with copper vacuum insulation." We are not sure of the exact science behind this, but we know the mug works well. Does it fit in a keurig brewer? It is 8.5" tall, so it depends on the brewer. On the Keurig we have here, it is too tall. Can you drink out of the mug without completely removing the lid? 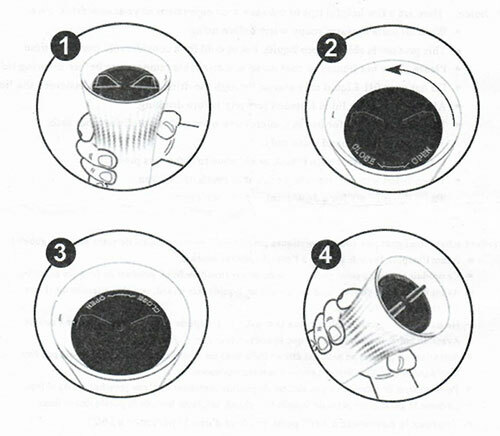 Yes, just turn the lid 180 degrees to open it and you can drink from any part of the rim.